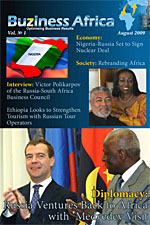 ADDIS ABABA, Ethiopia, November 28, 2016 (Ethiopian Herald) -- Ethiopia has opened its Honorary Consulate at St. Petersburg, Russia, aiming to strengthen diplomatic relations between the two countries. A press statement from the Ministry of Foreign Affairs said Ambassador Extraordinary and Plenipotentiary of Ethiopia to the Russian Federation Girum Abay opened the Honorary Consulate. During the opening ceremony, Ambassador Girum held discussion with Alexander Vakhmistrov, elected to be Ethiopia's Honorary Consul in St. Petersburg. Ethiopia's delegation led by Ambassador Girum visitted St. Petersburg and conferred with Chairman of St. Petersburg's Foreign Relations Committee Grigoriev E.D, head of the city's tourism development committee as well as head of chamber of commerce and industry on ways to strengthening the two countries' historical relation in trade, tourism and other sectors. Chairman of St. Petersburg's Foreign Relations Committee Grigoriev E.D said on the occasion that the appointment of Ethiopia's honorary consul in the city would bolster the Ethio-Russia relations. In the discussion, St. Petersburg's officials were briefed on Ethiopia's untapped potentials for investment, trade and tourism. The Ethiopian delegation also held discussion with members of the Ethiopian diaspora in St. Petersburg on latest developments in the country.